Abstract: High dependence on the hunting and consumption of large mammals by some hominins may have limited their survival once their preferred quarry became scarce or disappeared. Adaptation to smaller residual prey would have been essential after the many large-bodied species decreased in numbers. We focus on the use of a superabundant species, the rabbit, to demonstrate the importance of this taxon in Iberia as fundamental to predators. We show that the use of the rabbit over time has increased, and that there could have been differential consumption by Neanderthals and Anatomically Modern Humans (AMH). Analysis of bone remains from excavations throughout Iberia show that this lagomorph was a crucial part ofthe diet of AMH but was relatively unutilised during the Mousterian, when Neanderthals were present. We first present changes in mammalian biomass and mean body mass of mammals over 50,000 years, to illustrate the dramatic loss of large mammalian fauna and to show how the rabbit may have contributed a consistently high proportion of the available game biomass throughout that period. Unlike the Italian Peninsula and other parts of Europe, in Iberia the rabbit has provided a food resource of great importance for predators including hominins. We suggest that hunters that could shift focus to rabbits and other smaller residual fauna, once larger-bodied species decreased in numbers, would have been able to persist. From the evidence presented here, we postulate that Neanderthals may have been less capable of prey-shifting and hence use the high-biomass prey resource provided by the rabbit, to the extent AMH did. Figure 2. 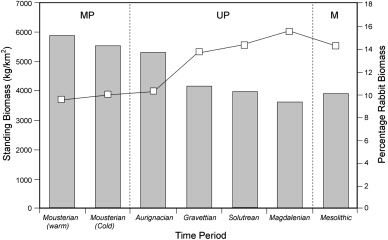 Changes in the overall terrestrial mammalian standing biomass (kg/km−2) (grey bars), calculated for faunal assemblages from the Mousterian to the Mesolithic. The black line denotes the percentage contribution to the overall standing biomass made by the rabbit for each time period. MP = Middle Palaeolithic; UP = Upper Palaeolithic; M = Mesolithic. In this study, data for the Mousterian are from the latter stages of this period, between 70,000 and 40,000 BP, where warm and cold climatic regions were present. Here we represent faunal assemblages for these two types of environments. The Iberian Peninsula constituted one of the southernmost limits of the steppe-tundra expanse and was occupied by these faunas during the coldest periods (Álvarez-Lao and García, 2011). In the Iberian fossil record, the presence of cold-adapted mammal species is occasional and restricted to specific time spans and, in most cases, to limited geographical areas. The sites that have yielded cold-adapted species are distributed irregularly along the Iberian Peninsula, most of them located in the north, where the climatology and landscapes are more similar to central European localities. It is likely that the Pyrenees and Cantabrian Mountain Range functioned as geographic barriers for some of these species. This faunal community is closely related with the steppe-tundra characteristic of the Pleistocene glacial periods, disappeared at the end of the Pleistocene alongside the mammoth fauna. After the end of the Pleistocene. Some of these species (reindeer, musk-ox and arctic fox) moved northward to arctic areas, a few others (as saiga antelope) migrated to the central Asian steppe and some other species (as woolly mammoth and woolly rhinoceros) became extinct. The loss of these megaherbivores is clearly observed in the drop in biomass shown in the graph. Although climatic differences in the north and south of the Iberian Peninsula also occurred within the other time periods, we have only differentiate these for the Mousterian because of the distinctiveness of the cold-adapted faunas that migrated from Eurasia.